Rotator cuff related shoulder pain is one the most common presentations which we encounter at Premier Physiotherapy. Your rotator cuff is comprised of a group of muscles which work to stabilise the “ball” of your shoulder in the “socket” as you move your arm 1. Why does it get painful? Again, this is a question which we are frequently asked. There are certain situations where imaging of the shoulder complex can absolutely be useful. However, as the majority of people we see who report rotator cuff related shoulder pain do not require anything other than conservative treatment2, imaging is not typically required. What if I have a tear – will I need surgery? A lot of the time in medicine, the terminology used can sound intimidating and is often unhelpful. A “rotator cuff tear” sounds finite and significant. There are, of course, times where surgery is an appropriate choice in the management of cuff dysfunction. However, it can help to understand that many people with evidence of tearing on MRI do not have any shoulder pain 3 and so repairing the “tear” may not be clinically appropriate. In fact, it may be more useful to see rotator cuff degeneration/tearing as we would see grey hair and wrinkles – a normal, mostly harmless, feature of ageing. What can physiotherapy help me with? First and foremost, we are experts in the diagnosis of rotator cuff related shoulder pain and can assess whether you are likely to benefit from physiotherapy treatment or if you need onward referral for orthopaedic opinion or imaging. We can advise you on how best to manage your discomfort and may use manual therapy techniques along with exercises to assist you in pain relief and to restore your confidence in movement. Ultimately, treatment will consist of an exercise programme to restore your ability to tolerate loading of the shoulder complex and rotator cuff and to facilitate a return to your individual baseline. Tim is an experienced chartered physiotherapist with a masters degree in Sports Physiotherapy who has worked in several highly renowned clinics in Ireland, as well as in the Southern Hemisphere. As one of our Senior Physiotherapists, Tim has experience in treating all kinds of shoulder problems. These range from athletic injury and dislocation, to frozen or stiff shoulders – as well as everything in between. Contact the clinic to arrange for an expert opinion as to how best to manage your shoulder pain. 1. Lewis J, Rotator cuff related shoulder pain: Assessment, management and uncertainties, Manual Therapy (2016), doi: 10.1016/j.math.2016.03.009. 3. Minagawa H, Yamamoto N, Abe H, et al. Prevalence of symptomatic and asymptomatic rotator cuff tears in the general population: From mass-screening in one village. Journal of Orthopaedics. 2013;10(1):8-12. doi:10.1016/j.jor.2013.01.008. 4. Ainsworth R, Lewis JS. Exercise therapy for the conservative management of full thickness tears of the rotator cuff: a systematic review. British Journal of Sports Medicine 2007;41:200-210. Off to a Running Start…. The good weather has arrived and with that comes hoards of keen runners emerging to pound the pavements of Dublin’s fair city. Whether desperate for that summer body, training for that first marathon or simply glad to be active outdoors; it’s rarely long before the aches and niggles begin to creep in. Below is an overview of some of the most common injuries impeding avid runners’ momentum. Also known as PFPS or “runners’ knee”, patellofemoral pain syndrome causes pain at the front of your knee due to an irritation around the kneecap (patella). This can occur when muscle imbalances or weaknesses around the hip and knee cause malalignment of the kneecap while striding. Repetitive faulty tracking associated with running further or hill session might also exacerbate symptoms. The Achilles attaches the two calf muscles – soleus and and gastrocnemius – to the back of the heel. If inflamed – a result of excessive stress and consequent scar tissue build up – runners develop pain along the back of the tendon and into the heel. Calf tightness, foot posture, inappropriate footwear and overtraining can all be contributing factors to the development of Achilles Tendonitis. Plantar Fasciitis is an inflammation of the shock-absorbing band of tissue connecting the heel to the toes along the undersurface of the foot commonly manifesting as a stabbing pain in the arch or heel. Insufficient ankle mobility, foot biomechanics and footwear choices can impact the probability of developing the plantar fasciitis. The condition typically presents with the first few steps following rest reported as most painful. The IT band is a thick band of fascia running down the outside of the thigh from the hip to just below the knee. Iliotibial syndrome is an overuse injury thought to occur from prolonged or increased compression of the band close to it’s bony insertion with knee flexion and extension. This friction worsens with inadequate mobility and hip muscle weaknesses. 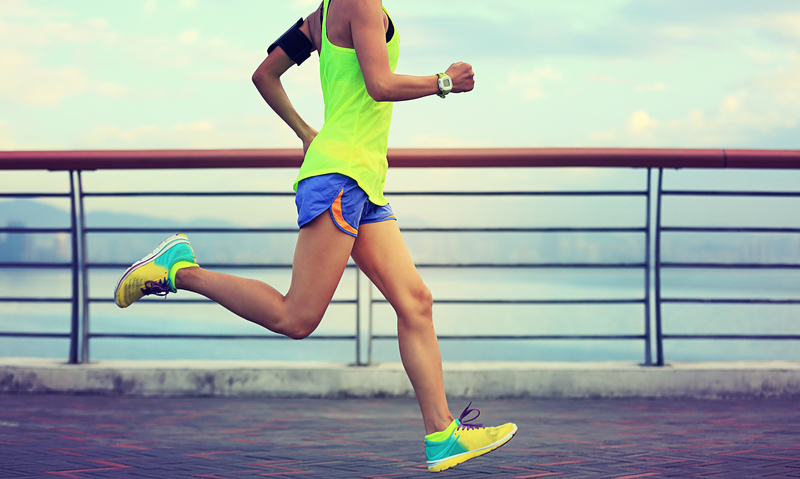 Subsequent inflammation causes pain on the lateral aspect of the knee which is progressively aggravated while running. Runners can present with low back pain for a multitude of reasons. Deficient hip mobility, weak core musculature and poor lumbopelvic control contribute to disproportionate pelvic tilting or rotation and exaggerated stress on intervertebral joints. Consequential postural defects and improper running technique can cause undesirable back pain during and/or after running. All of these running injuries and more, can be resolved and oftentimes prevented by assessment and appropriate intervention with our physiotherapists. Please contact us today on (01) 296 4964 or at info@premierphysiotherapy.ie for an in-depth evaluation and a range of treatment options to help tackle your pain appropriately. Alice Fallon is a chartered physiotherapist with a Masters in Sports and Exercise Medicine from Trinity College. She has divided her time between working in private practice – both at home and abroad – and with division one rugby clubs and inter-county GAA teams. Alice recently returned from touring internationally with Riverdance as Chief Medical Officer and is also a certified Strength and Conditioning specialist. The balance between training load and performance, versus overloading and injury can be difficult to objectify. The thought that increased training is advantageous and therefore the athletes need to train hard to optimise performance may not be beneficial. Therefore, understanding some basic principles of load and some strategies to monitor it are important for hopefully remaining injury free and sporting success. Drew & Finch in 2016 defined the workload as either external or internal loads. Internal Loads: Quantifies the individuals response to external loads placed upon them or an individual’s perception of effort. This may be in the form of measuring post exercise heart rate or commonly the Rate of Perceived Exertion (RPE) is utilised which is a scale from 0 to 10 (Borg scale). External Loads: Quantifies the amount of workload external to the athlete. For example, cycling distance/terrain, running distance, swimming distance, golf swings. In recent years strength and conditioning departments working with teams have monitored player’s running loads with GPS units. Workload can be calculated by multiplying the external load (e.g. distance run) by the internal load (e.g. RPE) and can easily be recorded over a 7 day period (acute load). Research has shown that tissue within the body can still be reacting to load placed upon it 3-4 weeks after the event. This suggests why it can be difficult to identify a precise point in time for when injury occurred. Therefore, a long term (chronic load) workload (28 day period) is a useful tool. The goal of training is to try and establish a relatively steady, moderate loading pattern over a long period of time which the body can tolerate. If there are large increases in training volume or intensity, the acute load is sharply increased leading to a high Acute:Chronic Workload Ratio and thus an increased risk of injury. Research suggests that if this ratio exceeds 1.5, then a ‘spike’ in load has occurred and you are at a greater risk of injury (Blanch & Gabbett 2016). • Consider alternating training days into high, moderate, light loads over consecutive days and repeat. • Avoid large spikes (increases) in load: this often occurs following periods of inactivity, for example, post injury, or, when in training for a particular event. Roberto Pelosi is a Masters qualified physiotherapist and is the owner of Premier Physiotherapy in Dublin, Ireland. He has worked and taught internationally including time with professional soccer clubs in the UK, Rugby league in Australia and toured extensively with Riverdance-The show. He has a special interest in movement dysfunction and inefficiency and how it relates to injury and performance. Cycling has grown in popularity with recreational, competitive and functional (cycling as a means of commuting) all on the rise. From 1st of January to 31st of December 2014 there were 534 specific cycling related injuries presenting to the emergency department of St. Vincent’s University Hospital in Dublin. Bikes and biking events have become ever more specialist and technical. What has remained static, however, is the human body and with ever expanding cycling events comes a change in the physical demands placed upon the body. At Premier Physiotherapy our physiotherapists use their advanced knowledge and expertise to provide guidance on cycling injury and rehabilitation and in conjunction with bike fit specialists can work on bike set-up to ensure return to cycling post injury. Overuse/Overload: An injury sustained from a repeated action or resulting from a physical stress/load applied to the body that is greater than the tissues can tolerate. Traumatic: A physical injury of sudden onset and severity that requires immediate intervention. 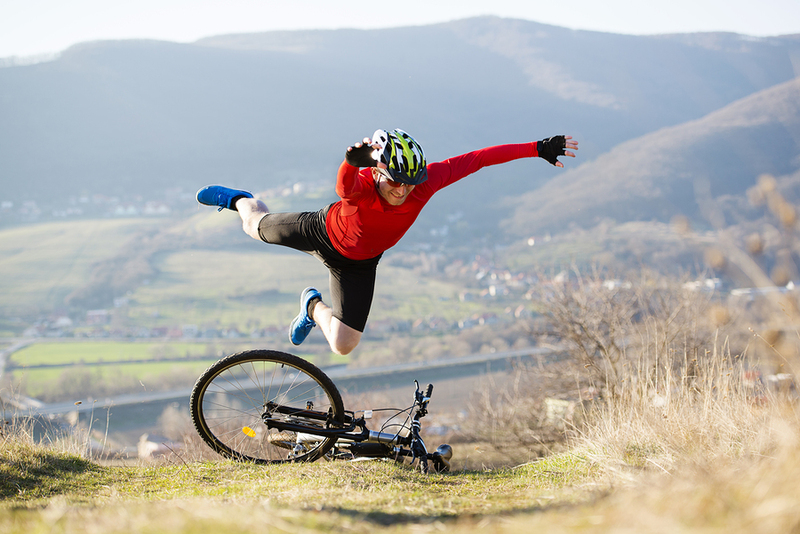 Overuse cycling injuries most commonly include knee pain, back and neck pain, achilles tendon problems and wrist pain. Traumatic injuries most commonly result from accidents due to falls and crashes and typically include fracture/break of the collar bone, the wrist, contusions (bruising) to soft tissue and/or bone and head injury. Collar bone injury is the most common fracture seen in cycling and usually happens when cyclists fall onto the point of the shoulder, referring the impact along the collarbone and causing it to break. The break can be very painful and is usually diagnosed by an x-ray. Pain relief and immobilisation with a sling will be the first course of action. Sometimes, the position of the fracture may require surgery to insert a small plate to hold the bone in place while it heals. The affected arm should remain in a sling for up to 4-6 weeks. During this time our physiotherapists can provide guidance on exercises to ensure the shoulder joint does not stiffen and surrounding areas are well maintained. As the bone heals and the pain resolves, our physiotherapists will provide further exercises that focus on improving mobility and strength. It is important to remember that moderate weight bearing through the upper extremities is required when cycling. The scaphoid is a small bone on the thumb side of the wrist that can fracture when a rider puts a hand out to break a fall. Other bones may also fracture depending on the mechanism of the fall, but the scaphoid is one that most commonly results in complication. Scaphoid fractures often do not show up on an immediate x-ray but will usually present in a follow-up 10-14 days later. Non-union (poor healing) is not uncommon resulting in the need surgery, but in most cases the wrist will be immobilised in a cast/splint for up to six weeks to allow the bone to heal naturally. Once the cast has been removed, our physiotherapists will guide the person through a series of exercises designed to regain range of motion, strength for the wrist, hand, forearm, elbow and shoulder. This is very important as a cyclist needs good strength to maintain control of the bike, as well as to comfortably take weight through the upper extremity. Soft Tissue or Bone Contusion/Bruising. This is where a muscle or bony prominence – most often around the hip and thigh – gets bruised in a fall. The impact of the fall can cause damage to the muscle or bone causing swelling and visible bruising. Knee pain is the most common pain seen in cyclists and occurs due to the highly repetitive motion of the knee flexing and extending with pedaling. A knee normally moves over the toes as the pedal goes forward. 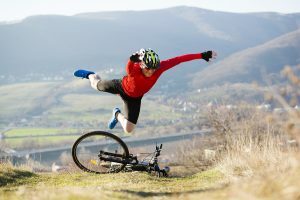 Excessive sideways motion of the knee or poor bicycle set up can accentuate the forces going through the knee and lead to irritation of various structures around the knee. Where bike set up is correct and cyclist position is good, pain may arise from an over exertion due to increasing distances or cycling effort too quickly. Our physiotherapists will firstly evaluate the knee to diagnose the problem and advise treatment specific for the tissue irritation/injury. Once the diagnosis has been determined, a program of rehabilitation will be advised and may include manual therapy, and flexibility/mobility exercises. Strengthening exercises are often required. Education on tissue loading and training loads is important so that wherever possible you can continue to cycle. Achilles tendonitis/tendinosis is characterised by pain in the Achilles tendon. This occurs as a result inflammation of the tendon (itis) or due to a disorganisation of the structure of the tendon (osis). Pain management through following the ‘POLICE’ principle, coupled with a rehabilitation program of specific exercises to help encourage repair of the damaged fibers in the tendon and strengthen calf muscles and adjoining areas. Occasionally cyclists suffer foot pain. This may occur due to the constant pressure being applied through the front of the foot during pedaling. This pain may originate from the soft tissues of the foot, but occasionally result from irritation to nerves running through the foot. This condition is treated locally to facilitate resolution of pain however assessment of footwear or the assessment of cleat/shoe position may be required. Hip position/mobility and strength will be investigated to determine sitting posture and good force generation. Frequently load placed at the foot results from poor cycling technique. Is there a point to stretching? Physiotherapists, coaches, personal trainers and many others have advocated stretching as part of a sport specific warm up/cool down program. Others such as yoga and pilates instructors have prescribed stretching while in pursuit of various fitness goals. All of us will have all heard the testimonials from people who believe that lack of stretching was responsible for a particular injury they suffered. However, recent research has suggested that stretching might not be all we thought it was. Through this blog I will re-examine the role of stretching and provide a summary of the scientific evidence and my interpretation on these findings as they relate to stretching. As a starting point, let us ask ourselves why we stretch? Studies suggest that stretching before exercise does not prevent injury. One such comprehensive study investigated the effects of stretching and not stretching on Australian army recruits. They investigated 1538 subjects which represents a comprehensive cohort. The investigators found no reduction in the risk of injury associated with exercising when they compared a group who stretched against a control group who did not stretch. In another publication produced by the researcher, Shrier, he performed a comprehensive review of the scientific literature relating to stretching and injury. He reported that stretching before exercise, either increased the risk of injury or made no difference to the rate of injuries. It is a general held belief that stretching will limit or alleviate post exercise soreness, often referred to as DOMS (delayed onset muscle soreness). Research has shown this not to be the case. Following on from this, where an injury has occurred with activity and an acute inflammatory event has begun it would be advised to refrain from any activity that will apply a load or stress to tissue and as such stretching should not be applied in the acute phase of an injury, i.e. first 3 days after the injury has occurred. From my 24 years of clinical observation it is my belief that shortening of muscles is relatively uncommon. In most instances what I observed is that the resting tone (tension) for a muscle may be too high. All muscles have a resting have tone. You can consider ‘tone’ as a measure of the resistance within a muscle to lengthening. Too much or too little tone is a bad thing. At one end of the spectrum we might have a spastic muscle with very high tension or at the other extreme a very floppy or ‘flaccid’ muscle. So ‘short muscles’, are really muscles sitting with increased tone. The causes behind this increased tone are varied. Frequently it is associated with poor / inefficient movement patterns. These inefficient movement patterns may be, (a) learnt, i.e. occur with motor development or (b) acquired following injury or associated with pathology. There can be other reasons behind changes in muscle tone that your physiotherapist might diagnose with clinical reasoning and physical examination which can be discussed with you when needed. With regards to points (a) and (b) above, I believe the best treatment approach is to alleviate the abnormal movement pattern. This means that when we teach you to move with improved efficiency, your muscle tone adapts and lets you maximise ‘your flexibility’. We are not all designed to touch their toes or do the splits. What we want to achieve is your maximum movement potential. To highlight some of the positives that studies have demonstrated regarding stretching and improved movement. There have been a number of studies that highlighted that static stretching can result in a greater range of motion (ROM) about a joint. The studies noted that stretching had different effects on different muscles and that some responded to longer stretching to facilitate an improved ROM. What this research into static stretching did demonstrate was that the improved ROM occurred as a result of a change in tolerance to stretching and not due to any increase in the internal properties of the muscle (lengthening of muscle). In summary, the current the best theory is that stretching increases your ‘stretch tolerance’, either by decreasing the pain threshold, and/or decreasing the muscles resistance to stretching. It does the latter by temporarily altering the receptors in your muscles, tendons, and ligaments that usually react to stretching by making your muscles tighten up. There are a lot of possible mechanisms, and we don’t quite understand it all yet. Therefore, if you are going to attempt to improve your ROM of a joint via static stretching then you should perform stretches on a daily basis. These stretches should begin after first performing a 5 minute warm-up. You must hold the stretch for 30 seconds and repeat 4 -5 times. This will produce changes in ROM in less than 6 weeks. Following from the above information the next question might relate to Dynamic stretches and their effects. It would appear that dynamic stretching can encompasses most aspects of functionality without any negative effects on reaction time. An athlete could conceivably be more prepared physiologically to perform their required activity by implementing aerobic activity and sport specific dynamic stretch to increase blood flow, flexibility, and priming the body for imminent sporting activity. The effects of warming up (increasing body temperature and blood flow) appropriately has been shown to reduce the risk of injury and therefore dynamic stretching might be effective in that it falls into this category. The key here is not to tire the body through an excessive warm up. So to conclude this complex area around the need to stretch. It is important that the hundreds of published articles investigating the effects of stretching are critically reviewed. Those studies that support the use of stretching as a method of limiting injury are numerous however these studies tend to show at least one other effective co-intervention. What this means is that there were other interventions/factors that could be responsible for limiting injury rates. When these variables are accounted for through appropriate analysis then there remains little experimental evidence that stretching before exercise prevents injury or facilitates performance enhancement. Another criticism of the literature it is that not all sports are adequately represented in the studies. Therefore performing activities that require a significant range of motion (e.g. gymnastics) may in the future show that stretching is beneficial. What is known however is that were you are performing activities that requires explosive power or muscle strength/endurance then stretching should not be used as part of the pre exercise regime. I am aware that this information will challenge traditional approaches to preparing for exercise. What is obvious as a practitioner who has dealt with athletes and clubs is that quite often the principles of exercise are handed down through generations. I stretched, therefore I now encourage stretching. Research doesn’t support this and it is research that can drive us forward to better injury prevention. I hope you enjoyed this review and continue to follow us on our future blogs.